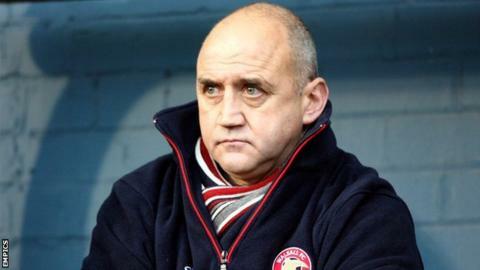 Cambridge United have appointed former Luton boss Richard Money as head coach, with Jez George reverting to a director of football role. Money will deal with all first-team affairs, including picking the team. "I've worked in this structure before. It's the right structure. It's the way forward," 56-year-old Money told BBC Radio Cambridgeshire. Luton (Oct 2009-Mar 2011) : Games, 84. Won, 46. Lost, 17. Walsall (May 2006-April 2008): Games, 103. Won, 44. Lost, 26. Scunthorpe (Jan 1993-July 1994): Games, 70. Won, 23. Lost, 23. "The role of head coach is the right role for someone in my position. I'm very pleased to be here." The former Fulham and Liverpool defender has had spells managing abroad in Sweden and Australia and has been boss at Scunthorpe and Walsall. George will return to the director of football role he occupied before he took the reins at the Abbey Stadium in February 2011. He initially took the job on a caretaker basis, saving the U's from relegation in the Blue Square Bet Premier. He has since worked under strict financial conditions, putting an emphasis on using local youngsters, and secured a mid-table position last season. But the former youth team coach, who has gained only three wins this season, has always stated he would step down as manager when he felt the time was right. In a statement he said: "This season expectations have grown with new signings and the club celebrating its centenary year. "Despite us having the youngest squad in the league, I believe our results have been unacceptably poor."